Who wants to use buttons and apps to start streaming video when you can just yell at your virtual assistant? No one, that's who. Google Assistant added support for starting Netflix streams a while back, but other services have been slow to follow. There's a new one today, though. HBO Now subscribers can plug into Assistant in just a few steps. HBO Now is the standalone paid streaming subscription for HBO. So, you don't need a cable plan to use it like HBO Go. If you are a subscriber, head into the Assistant settings (or Google Home app) to add your account. You'll find the necessary menu under "Videos and photo." Simply tap the link button and sign into HBO Now. 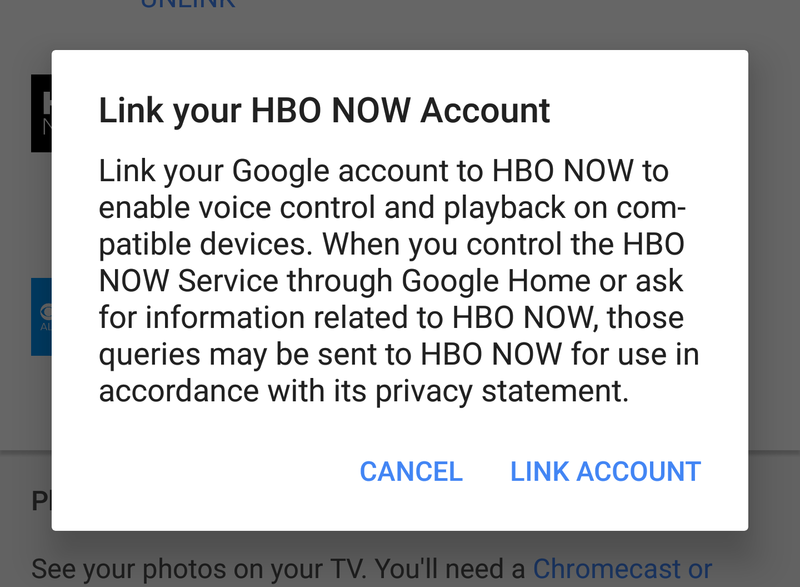 With your account linked, you can use Assistant commands to call up TV shows and movies from HBO Now, and have them play on a specified Chromecast device. This feature was announced way back at I/O in May, so Google and HBO sure took their time to work things out. Oh well, better late than never.